The 9th Annual Forum of the EU Strategy for the Baltic Sea Region (EUSBSR) will be held in Tallinn on 4 – 5 June 2018. The Annual Forum will be hosted by the Ministry of Foreign Affairs of Estonia together with the Baltic Development Forum in close cooperation with the European Commission and other partners. About 700 participants from governments, international organisations, NGOs, universities, local and regional administrations and businesses will come together to discuss developments and challenges in the Baltic Sea Region. Policy Area Innovation will arrange two separate seminars at the Annual Forum in Tallinn. 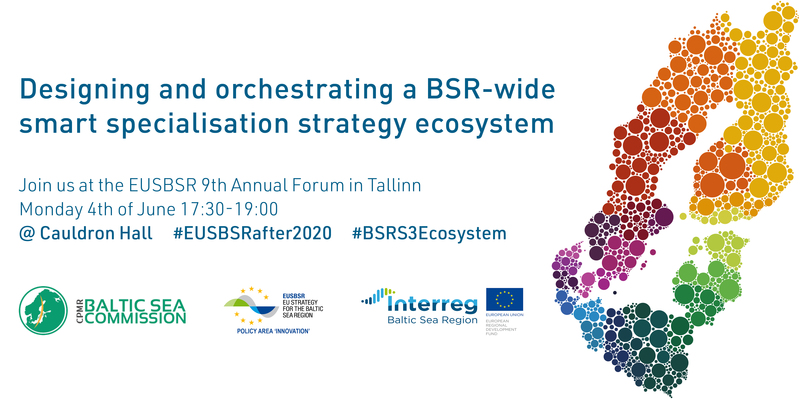 The first seminar, Designing and Orchestrating a BSR Wide Smart Specialization Strategy Ecosystem, will be arranged on Monday the 4th of June at 17:30 – 19:00. The second seminar, Fostering entrepreneurship by managing talent density, will be arranged on Tuesday the 5th of June at 11:00 – 12:30. The seminar session on Designing and Orchestrating a BSR Wide Smart Specialization Strategy Ecosystem will be arranged by Policy Area Coordinator Nordic Council of Ministers together with the Baltic Sea Commission and BSR Stars. The seminar will take its starting point in the fact that regions need to take on the challenge, be prepared to take responsibility and understand their role as architects and orchestrators when designing a future Innovation Ecosystem for S3, making use of potential pan-baltic value chains. The seminar will aid this process through introducing the participants to the newly developed Smart Specialization Platform in the BSR and explain how it will help to solve region’s growing need for match-making structures between the regions themselves in order to ensure collaboration and enhanced outcomes. The seminar will also serve to explain the potential for the Smart Specialization Platform to serve as a basis for the development of new sophisticated innovation ecosystems within the Baltic Sea Region. The seminar session on Fostering entrepreneurship by managing talent density will be arranged by PAC Poland together with Policy Area Education with support from Future Place Leadership. The seminar concerns identifying and assessing different approaches regarding educating, retaining and working with digital talents. Several key players from governments and regions as well as innovative firms that are at the forefront of attracting and developing digital talents will be present for a panel discussion, sharing their experiences on the subject. Through discussing question such as how to retain the talent created and how to grow the human capital already present in the region the debate will strive to identify whether there is a need to form a BSR-wide strategy to attract talent from outside the BSR. Further, the panel debate will assess whether talent-flow imbalances within the BSR should be of any concern and how to potentially achieve a balance in these, and if there is any scope for developing a joint ecosystem to improve talent management. We look forward to seeing you at the seminars! For more information and to register, please visit the EUSBSR website.